Firstly I'm re-painting the hull. The black needed touching up where the brass hatches were fitted and I also needed to move the water line down a few millimeters. The red needed touching up where I rubbed down the black to key the paint, so it seemed easier to re-spray the hull completely. The preparation was to rub down the hull completely with fine wet-n-dry to give the paint a rough surface to key to. This was wiped with thinners to clean off any dust. 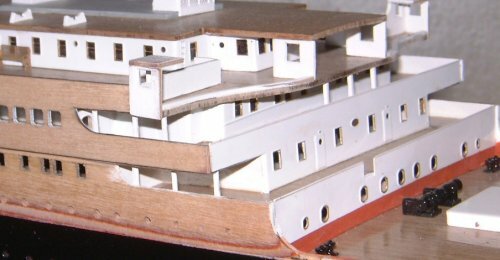 Next I masked the superstructure. This was a bit of a pain to do, and you need to be careful of any deck fittings you've glued in place. I really hope you haven't fitted any hand rails as they will almost certainly get bent. I'm hoping that my benches have survived. 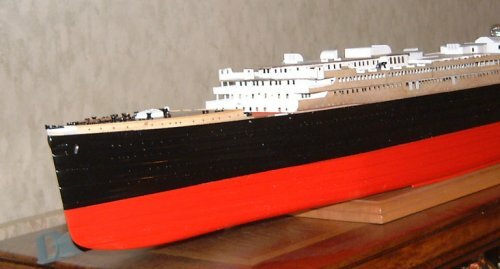 Here you can see the superstructure has been masked, the lower part of the hull painted red, and the waterline marked with masking tape. The red was given about 3 days to harden before it was masked. 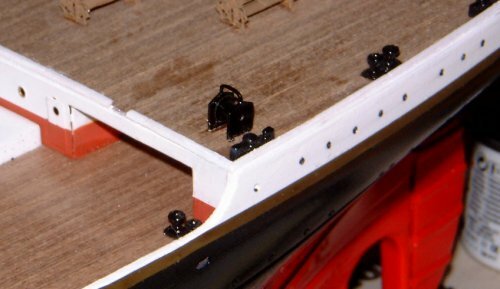 Also note that if you are spraying the hull, all of the lower hull will need masking before spraying the black. 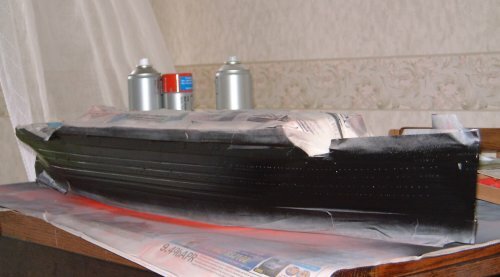 I will give the hull sides a coat of primer before the coat of black paint. This is mainly because the first few etched brass parts didn't get primed before being glued to the hull. The brass really does need a primer coat to get good adhesion. The black also has a tendance to run away from the glossy corners of the second layer planking, allowing the red to show through if you look carefully. The primer stops this happening. ...and finally with the masking tape removed. It's almost like a butterfly emerging from a cocoon. These are the sections of deck supports made up. It's not very clear in the picture, but the non-glued side is completely painted (on the left) and the glued side is only painted above the deck wider strip. This give a paint free area to apply glue to. 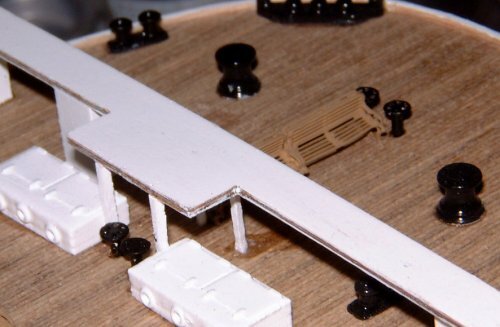 You can also see a strip of 1x1mm wood painted white. This will be used to make the individual supports. These pictures show the supports on place. When I made the supports I deliberately left the supports too long, and trimmed them to fit the model. These were glued in place using a viscous Super Glue. This sets a bit slower than normal super glue and gives you half a chance to get the parts in the right place before the glue sets. Here are the remaining supporting posts in place. Nothing special worth mentioning, but just take your time to get the length of each upright exactly right. Here you can see where I've masked the black and painted the white. I had to fill a couple of join lines in the side wall with car body filler, and then gave the model 2 coats of white. This is how it looks with the masking tape removed. I've still got the other side to paint, then I'll be applying the gold trim. The other side has been painted now, and I've started work on the smaller parts that came with this issue. I've added a gold trim line round the model. 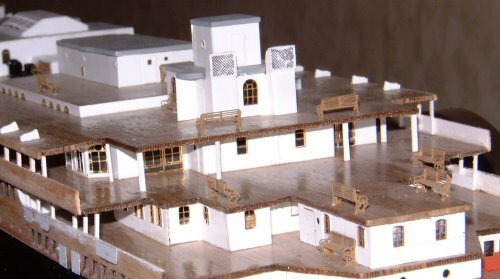 I used R/C model trim - it comes one a 2.5m roll, with various widths on the roll. Available from Ripmax stockists. I used the 2.1mm wide strip. I used gold, but you can get yellow as well. 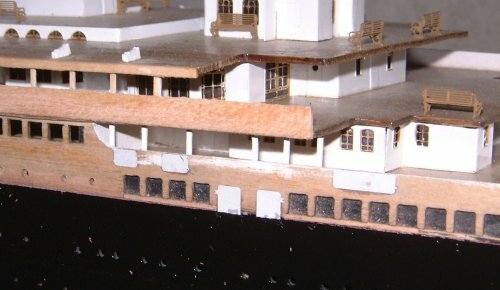 I've also touched in the windows with black paint - they got white paint on them when I painted the topsides. Finally the lettering was touched in with white paint and a very fine brush. I rubbed the black paint off the tops of the letters very carefully before painting to give me a flat surface to paint on. 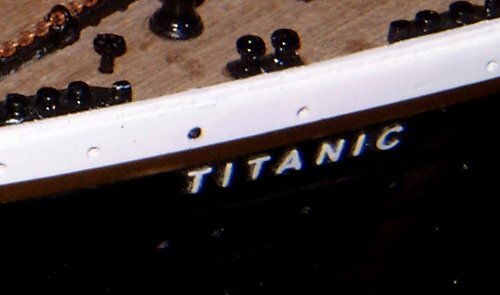 The brass bits below have all been painted black/white as appropriate. 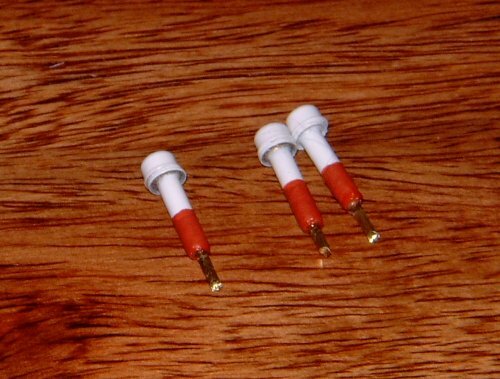 I've done the small valve hand wheels slightly differently to the instructions. 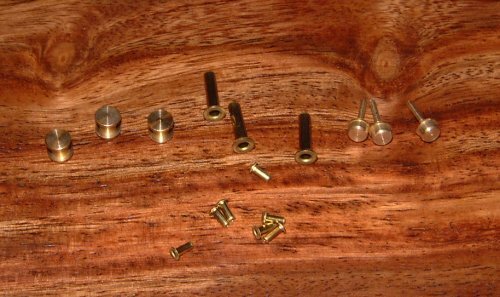 The brass eyelets have been fitted upside down, for two reasons. Firstly, I will get a stronger glue joint at the top, by having a larger area on the eyelet to glue, and secondly, it will allow me to drill a 1mm shallow hole in the deck, so I get a good fixing to the deck as well. You can see I've left the hand wheels attached to the fret while I glued the eyelets. This just made it easier to handle. I cut them free after the glue dried. The three rollers were quite straight forward. You will find a small pip on one side of the roller. Locate this in the hole in the etched part to get it in exactly the right position. Then fold the etched part up, and finally over the top and glue the other side. The photo shows the three stages. The vents were straight forward. A tip for Superglueing metal parts. Give the back of the brass fret a gently rub with fine wet-n-dry. This just roughens the surface and the Superglue will grip much better. Give the other metal parts the same treatment on the surfaces to be glued. It's also a good idea to thoroughly de-grease the parts before you glue and paint them. I use cellulose thinners. This is very effective, but the fumes are dangerous, and it will damage any furniture, plastic and many other materials if you spill it. White spirit is just as good, and somewhat safer, but takes longer to evaporate. Here are the valves glued to the deck. I actually painted these 'upside down' using my masking tape method. This left to tops of the hand wheels unpainted, but these were easy to paint after the parts were fixed to the model. 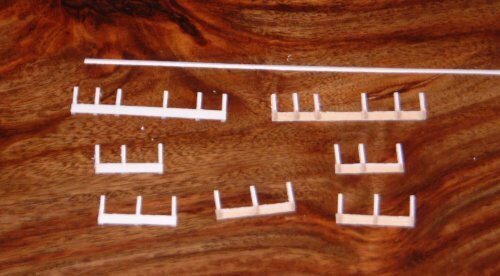 I drilled a small hole, nothing much more than a bit of a depression in the wood really, to give make it easier to put them in the correct position, and Super-glued them in place. Here are the hand wheels for the stern. ...and finally the rollers for the stern - theses were just glued in place. 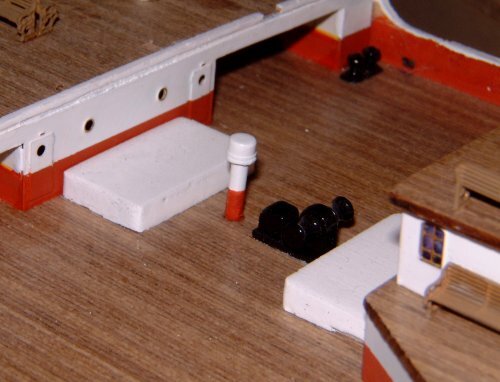 The only thing left to do for this weeks work is to fix the couple of parts that are painted white and ochre, (or rusty red on my model), and to touch in the ship's names in white paint. These were sprayed white, then the lower halves were brush painted red/brown. I didn't bother masking these - I just measured the right height and painted them by hand. 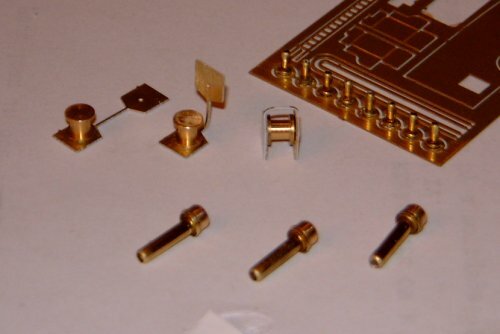 Its quite easy to get a neat finish on parts this small. I decided that these vents (I think that's what they are) would be better fitted with brass pegs to make them easier to fit. I found some brass rod just about the right size to fit inside the tube and superglued some short lengths in place. And here's the one that goes at the stern. Still got to paint in the ship's names. 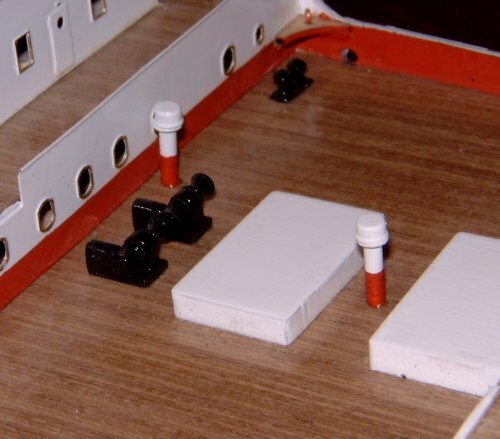 With hind sight, I would have stopped work at issue 39, and then waited for issues 64 to 67 so that I could fit the brass hatches before painting the hull. This would have avoided having to paint the hull twice.